I was so pleased when a friend of ours asked me to redesign an area of their back garden in the Balboa Park neighborhood of San Francisco. We had excavated a weedy area and bricked it in for them last year, to create a solid footing for a jewelbox-grouping of potted plants, but this particular project involves the centerpiece focal area of their garden. They already had a very nice garden, and are avid garden-party hosts, so it was all the more special to be able to create the new centerpiece. The area to be gardened has a nicely-pruned apple tree at the forefront, and a raised bed behind it with a pair of cycads, where they also keep a few seasonal veggies growing. My design was for the in-ground area around these. It had previously been blanketed by the iceplanty succulent aptinia, which we had to dig out and sift for roots. Fortunately, this area of San Francisco is quite sandy, and the soil is very easy to dig. 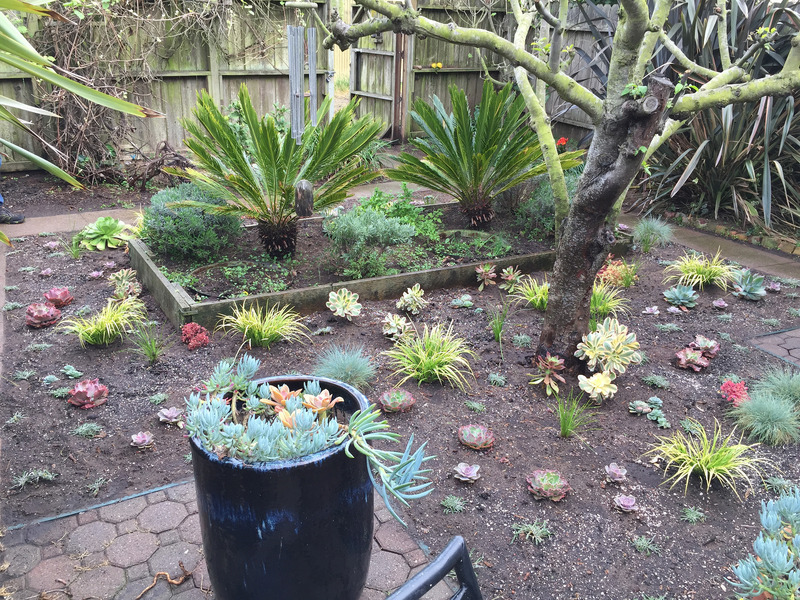 Sandy is also the perfect soil for succulents and many grasses. The garden has a touch of formality to it: a central axis with beds along both sides and the back, a tree in the center, and the cycads in a matched pair. They also have furniture and potted succulents/cacti in pairs flanking the central axis. My plan for the new plants was to arrange the plants informally, but still with a balance of colors. I achieved this through repetition of colors and textures, and by grouping plants in “colonies” on either side of the axis. The end result accentuates the formality brilliantly without detracting from the paired balance. It keeps the whole garden from being “too rigid” with every single thing in balanced pairs, but doesn’t stand out as discordant with the rest of the space. I met with them to discuss what plants and colors they like, and drew from the already-established plants along the driveway out front. They love succulents in greens, blues, and pinks, and already have some clumping blue fescues. Out back, I did the same thing. We planted a handful more of the same blue fescue (Festuca glauca), but since I planted a groundcovering layer of Dymondia margaretae, that will fill in densely and have that blue-grey base to it, I decided to add a couple of other grasses to repeat the form of the fescue but in other colors and textures. Lomandra ‘Breeze’ will be a large (2-foot diameter) green grass in drifts, and Acorus gramineus ‘Ogon’ will add little tuffets of yellow grass-like texture. I repeated the colors with aeoniums (‘Sunburst’ and leucoblepharum for some orange), and a slew of different echeveria species and cultivars, such as imbricata, ‘Giant Blue’, ‘Bluebird’, ‘Crinoline Ruffles’, ‘Red Ruffle’, and ‘Coral Glow’. Rather than scatter the succulents all around, I kept them grouped by type so that each corner of the bed has a bit of continuity to it, but as you walk around the whole space there are subtle differences in plants. I love knowing I’ve left a garden’s owners happier than they were before! I’d be more than pleased to have this space as my own. Can’t wait to see this one mature and the plants fill in! This entry was posted in boZannical Portfolio, Gardening and tagged design, durable plants, garden design, horticultural, microclimate, plants, san francisco, succulents, urban. Bookmark the permalink.